Nepal is the world’s best destination for people desire to climb adventure exploration peaks. Nepal comprises eight of the world’s 14 highest peaks over 8000m including Mt. 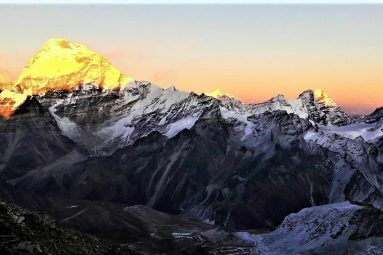 Everest (8850m), Kanchanjunga (8586m), Lhotse (8516m), Makalu (8463m), Cho Oyu (8201m), Dhaulagiri (8167m), Manaslu (8163m) Annapurna (8091m) along with thousands of other peaks that are above 5500m and less than 8000m. Nepal Mountaineering Association (NMA) has classified all expedition peaks above 7000 meters and trekking peaks under 7000 meters. Other high mountains for major mountaineering open to expedition under the patronage of the Ministry of Tourism. We coordinate with the different department of the government on behalf of the expedition team to organize and arrange both kinds of mountain climbing in Nepal’s Himalaya from small mountains to Mt. Everest, providing expert service with experienced Sherpa Mountain Guide, cook and supporting staff.